We go over a lot of details during our shark diving briefings in the Bahamas, and make a lot of recommendations. One of them, is that divers make a negative entry. But this is not always clear, sometimes confused, and often done incorrectly. What is a negative entry, and why do we recommend it? Simply put, a negative entry means that you’re getting below the surface as quickly as possible. Usually you make a giant stride from the boat with air in your BCD and hang on the surface for a moment to get yourself situated. With a negative entry, you’re jumping in with no air in your BC and making your way to the bottom. Why do we do this? 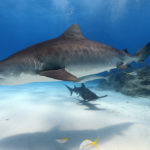 At Tiger Beach in the Bahamas, the shark diving is technically pretty easy, but there are some challenges. First off, we often have to wait for the reef sharks and lemon sharks to clear a path for us so that we can get off the dive platform. There are loads of sharks hanging around the surface and it’s a good idea to get down right away. Often times, when divers are lingering at the surface, they are distracted and not looking in the water. That’s where the sharks are! During the dives at Tiger Beach, we also occasionally experience strong currents. This means that the longer a diver spends at the surface, the further down current they will end up before hitting the bottom. Getting off the surface and down to the bottom quickly helps ensure that you end up as part of the dive group and not a lone diver down current having to struggle to make your way back to the line. Make sure you’re properly weighted – for our shark dives, that means wearing plenty of lead. Jump like a pro – make sure you clear the platform and exhale to empty your lungs. Equalize early and often – make sure you control your decent and equalize your ears, which likely means adding air as you descend. Finally, if you have any questions on the technique, just talk to the dive crew. They’re always there and happy to help out! We always prefer people understand and feel comfortable with the diving so they can focus on and enjoy the sharks!